Massimo from Milan: owner, baker, gelato maker. I had the pleasure to meet the man on my first visit to the small, tucked-away shop, Massimo's Delectables, behind the Vans store. He came out from the back, where all the magic happens, apron splotched with chocolate. I mentioned the place was hard to find, and he gave me a quick description of his operation: “Italian bakery, and we make gelato here. I am making gelato right now.” I could see the flavor on his apron. I immediately knew this was one of those places where I wouldn’t consider price as a factor; the handmade quality of product would be worth it. I gladly paid $8.50 for a pint of Guianduia (Hazelnut-Chocolate) gelato and two sandwich cookies. Luckily, I picked Massimo’s favorite flavor, so it had to be good. “I love Nutella,” he told me, suggesting his Guianduia flavor is reminiscent of the popular European hazelnut-chocolate spread. I wasn’t disappointed when I tasted the incredibly rich gelato straight from the carton when I got home. Simply hazelnut and chocolate, the flavor was as pure as it could have been. I couldn’t wait to visit Massimo’s larger location, Massimo’s Caffe, nearby in Venice which features pastries and gelato by the scoop. I needed a more efficient way to taste the other twenty-five or so flavors. Get your Guianduia by the pint at 13222 W. Washington Blvd. near Culver City, and by the scoop at 1029 Abbot Kinney Blvd. in Venice. Every Wednesday from 9 a.m. to 1:30 p.m., Arizona Avenue between 2nd and 4th Street in Santa Monica is brimming with fresh produce, lively vendors, scavenging restaurant cooks and chefs, generous freebies and very happy customers. 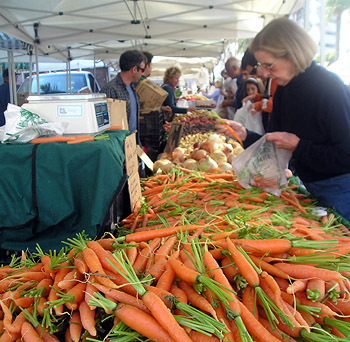 This Santa Monica Farmer's Market has become one of the largest and most popular in Los Angeles. My several visits have helped me to realize and be thankful for the ease of access we Southern Californians have to such abundances of fresh produce. The first stand on the south side of Arizona upon entering the market is Adams Olive Ranch of Strathmore, CA, handing out fresh cured olives and pouring samples of their cold pressed extra-virgin. The fresh cured olives are meaty and pleasing to the palate. Mild and firm, the powerful briny bite associated with the usual olive is absent. Any olive-hater could probably be converted using these fresh cured olives as training wheels. Delicious. Besides whole olives, fresh or fully cured, Adams Olive Ranch also offers jars of pickled vegetables (including the popular okra), Molinari Salami (a San Francisco company), jumbo pickles and an olive-salad, reminiscent of the essential muffaletta condiment. Continuing down the market strip, I've noticed the overwhelming number of organic farms out there. I would say, as an estimate, 70% of the farms at the market offer organic produce. Others advertise "pesticide free" fruits, vegetables and herbs. Right now, I can't help but purchase a super-sweet organic Fuyu persimmon to munch on each time I peruse the market. They are everywhere, in brilliant, seducing variances of orange. The Hachiya variety is tempting to the eye as well, but I have bitten into an un-ripe Hachiya persimmon one too many times, so I steer clear of eating them raw. Satsuma tangerines, Asian pears, apples galore, winter squashes, celery, rainbows of carrots, radishes, ever-present onions and colorful potatoes, table grapes, bags of citrus for a dollar. Oh, and sweet-tart pineapple guavas, which make for great samplers. Up until this month, even, a few farms still offered heirloom or other varieties of tomatoes. Ahh, winter in California. A few of my favorite stands don't even sell produce; Redwood Hill Farm goat cheese and Winchester Cheese Co. gourmet Gouda. Redwood Hill Farm is actually based up in Sonoma County, but the in-laws of the company's owner live in Santa Monica, lucky for us. The charming couple can be seen in their small stand on the south strip of the market, selling 6-ounce portions of a variety of the farm's artisan goat cheese. I've tried both the sharp cheddar (their most popular), which is excellent with the market's Fuji apples, and the Camellia, a creamy Camembert-style which I like with grapes. They also promote Redwood Hill Farm's goat's milk yogurt, which I learned can be purchased at Trader Joe's under the Trader Joe's label. You can't miss the Winchester Cheese Company. It's the stand with the vendors yelling out, "Get your cheese here! It's goud-a cheese!" If Gouda was sold like peanuts at Dodger Stadium, these good people from the Winchester Cheese Company would certainly have the job. The Gouda is transported from their dairy farm in Winchester, California (about 80 or so miles south-east of L.A.) to the market each Wednesday. They boast about the hand made quality of the cheese as they tempt you with samples of each interesting variety. The cumin Gouda got me, and I took it home to make a simple quesadilla with corn tortillas (quite delicious, if I do say so myself). There is so much to explore at the market. Bautista Family Organic Farm sells beautiful, plump, candy-sweet Medjool dates for a quarter each or by the box. Burkart Farms offers dried summer stone fruits as well as Satsumas, pomegranates, and my favorite Fuyu thus far at the market. Rutiz Farms from Arroyo Grande specializes in pesticide-free herbs, and it's not uncommon to overhear customers chatting with the Rutiz vendors about making the perfect tabbouleh with Rutiz's flat-leaf parsley, for instance. Flavorful wild spinach, or "lamb's quarters" can be found at the Malibu-based Vital Zuman Farm stand, with samples handed out by the vendor in the middle of the street. And if you make it to the far edges of the market without running out of time on the parking meter, you'll experience the natural wild yeast sourdough breads of Bezian bakery, as well as a lesson in healthful micro-organisms. Perhaps I'll soon branch out to explore one or two of the city's other several Farmer's Markets. But the Santa Monica market is like that menu item you always order at your favorite mom-and-pop joint; it's so perfect that you don't want to risk lessening the experience with anything else. I love surfas also BUT they are sketchy at times on the EQ. The selection is first rate and prices are palatable but they can be snooty, non-helpful and if you are in "their" way when they are restocking watch out! It can be very chilly customer service wise. This has made me choose going elsewhere at times - wish it were limted to just one off day but I have been going there for 5+ years and its been that way the whole time. I now just limit my visits to holiday time because they do carry some only found there items. I would like to shop there more.